Change in temper color can be also used for identification purposes. 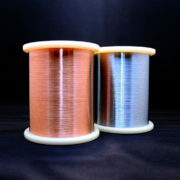 Our copper plated steel wire “Mac Wire CP” changes temper color according to the heat treatment temperature after spring-forming process, which can be used for identification management of similar springs. 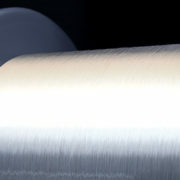 “Mac Wire CP” does not require spring coating for identification and realizes cost reductions. However, the change of the temper color shows the interference color of the oxide film caused by heat treatment.No color change occurs in heat treatment in a non-oxidizing atmosphere, such as a vacuum furnace. The photograph shows the results of our experiment. 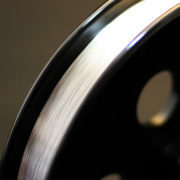 The color tone changes according to the heat treatment equipment used and actual conditions. The change in color tone shows the interference color of the oxide film caused by heat treatment, which is not subject to the heat treatment in a non-oxidizing atmosphere. 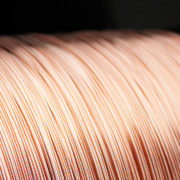 Conductivity is not affected by change in copper plating color due to heat treatment. 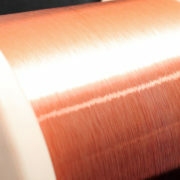 With “Mac Wire CP”, conductive performance and conductivity are not affected by color changes and oxide film generated on the copper plated surface due to low-temperature heat treatment. 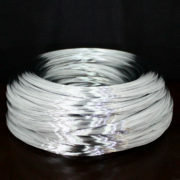 “Mac Wire CP “also has the mechanical properties by heat treatment the same as or similar to general piano wire. As there are no restrictions on heat treatment conditions, we recommend that you perform processing in an appropriate temperature range and time depending on the application and purpose of the spring. 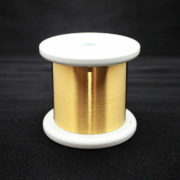 Non-oxidation heat treatment does not change the color tone and gloss of copper plated material. 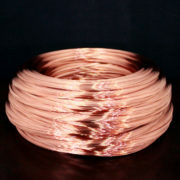 If you perform low-temperature heat treatment after spring-forming process using “Mac Wire CP” in a vacuum furnace or an oxygen-free gas atmosphere furnace, you can keep the color tone and gloss of copper plated material at the same level as the condition before heat treatment and prevent oxide film.